Pennyhill Park Hotel and Spa is a five red-star property on 123 acres of English countryside, about 30 minutes from London, and its 45,000-square-foot spa offers an extensive thermal circuit and a holistic, organic menu of services. Situated in Bagshot in the county of Surrey, near Ascot, Sunningdale, and Wentworth, the country estate houses 123 guest rooms, and dining delights include the award-winning Latymer and Brasserie restaurants. Expansive stretches of lush woods and parkland, abundant with topiary, gardens, ponds, and a calming waterfall, host the hotel's nine-hole golf course, tennis court, croquet lawn, and rugby pitch, the training site of the England Rugby team. Meeting venues total 20, and the hotel can accommodate everything from intimate weddings to large-scale parties of 200. Spa treatments are available to Spa Members and Hotel Residents. Non-residents can reserve treatments and use the facilities in conjunction with day spa packages. Spa breaks are only availble Monday -Thursday. Bed and breakfast rates can be chosen, however treatments need to be booked in addition to this. 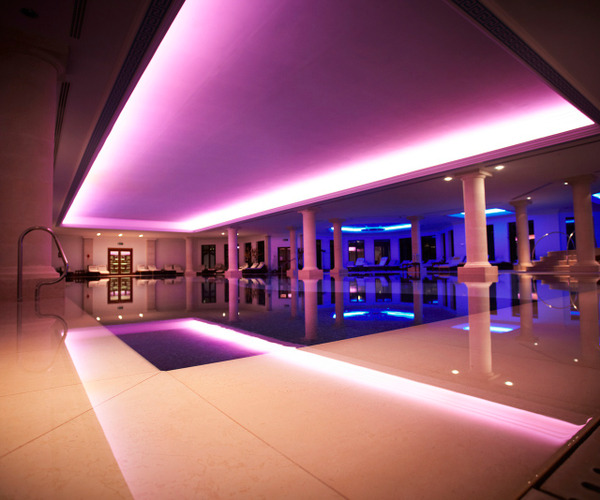 The Spa at Pennyhill Park Hotel, voted "Best Hotel Spa" in 2009 by the European Health & Spa Awards, is an elegant 45,000-square-foot facility with 21 treatment rooms and Italian marble interiors. The adults-only spa's architectural showcase is its Thermal Heaven, comprising separate and coed thermal saunas, steam rooms, and laconiums, an ice cave, and a tepidarium. The eight aquatic amenities include hydrotherapy pools, Jacuzzis, and a 25-meter swimming pool with underwater music. Separate men's and women's changing areas come equipped with showers. Ancient holistic healing rituals use natural, organic extracts, many sourced from local suppliers, infused with elements like jasmine, ylang ylang, lemongrass, and grapefruit. Offerings include facials, massage, mani/pedi services, alternative treatments like reflexology and reiki, body wraps and scrubs, and signature therapies like the three-hour Dreaming. Day and overnight packages are also available. The 3,000-square-foot fitness center features Technogym equipment with entertainment systems and a bevy of exercise and dance classes, among them Pilates, Ashtanga and Flow Vinyasa yoga, Zumba, salsa, and aerobics. Personal training is also available. Golfers can tee off at Pennyhill Park's nine-hole golf course or head to the prestigious Wentworth Golf Club and Sunningdale Golf Club, both about five miles away. Other recreational pursuits include tennis, croquet, clay pigeon shooting, and archery (advance arrangements are required). The eight outdoor swimming pool, hydrotherapy pools, and hot tubs are open year-round. The hotel is 45 minutes from downtown London, and a good number of cultural destinations, including Windsor Castle, Ascot Racecourse, and Hampton Court Palace, are close by. The country house hotel has 123 guest rooms and suites. Uniquely designed interiors offer amenities like customized furnishings, handmade mattresses with a pillow menu, mini-safes, and tea/coffee caddies. Guests have their choice of standard rooms (24 to 29 square meters) and junior suites (35 to 98 square meters) with sitting areas. Select suite accommodations (52 to 105 square meters) are appointed with walk-in showers or four-poster beds. Culinary options include the Brasserie, 2AA Rosette-awarded venue open for breakfast, lunch, and dinner. Menu highlights include traditional British fare and grilled dishes that emphasize local produce. On Sundays, guests can enjoy live jazz during lunch. 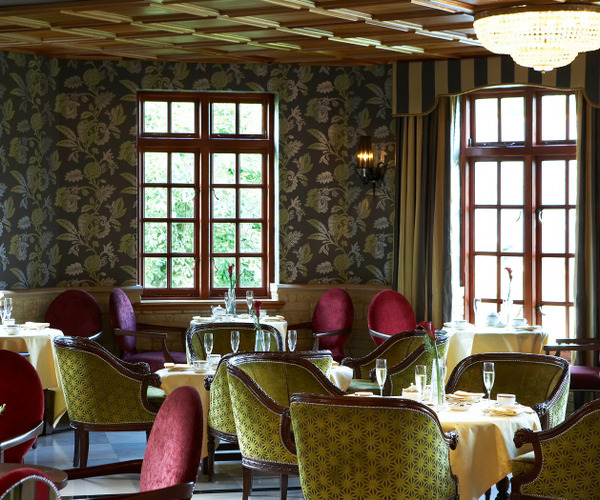 The hotel's fine dining restaurant, Michael Wignall at the Latymer, which has garnered Michelin-star and 4 AA Rosette awards, features contemporary European fare, a vegetarian tasting menu, and a 200-plus collection of fine wines. Up to eight diners can reserve a seat at the chef's table, and lunches can be enjoyed on the terrace during the summer; private dining is also available. Themis Restaurant, located in the spa, offers an à la carte menu of nutritional cuisine in a relaxed setting, where guests are invited to enjoy brunch and afternoon/evening high tea in their robes. All diets, including vegan and vegetarian, can be accommodated upon request; kosher food options require an advance notice.